Wall Hanging your Flat screen Plasma/LED or LCD TV is becoming more popular by the day. It's also a great way to make more room in your home. The thing is, it is a difficult job to do and if not mounted correctly can cost you your TV. We will make sure your Plasma/LED or LCD TV is mounted securely on the wall, and also level, as the last thing you want is your TV set at a crooked angle! 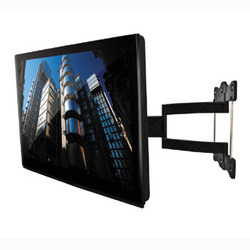 We have a selection of TV Wall Brackets we can use or you can supply your own. From the wall brackets for a portable TV to the brackets for 63" Flat Screen TV. We will make sure that you have the most suitable bracket for your TV. When your TV is securely wall Hung we will Tune it in and complete the set up. So, What does it cost to wall mount a TV?